It's very easy to grow your own beets from seed in your garden. Months later, when you pull them out, wash them off, cook them up, and take a bite, you very likely will change your mind and join the ranks of the beet lovers everywhere! Freshly-harvested beets . . .
the deep red color comes out after cooking. Beets are among the least-demanding garden plants, easy to grow and not bothered by bugs. But they do appreciate loose, rich soil so that the roots can reach downward and bring lots of energy to the beet, and also need a drink of water just about every other day. If you have a rabbit problem, you might need to put up a simple chicken-wire enclosure when the beet leaves are young and tender, too. To plant beets, buy beet seeds in early spring and follow package directions. The trick is to keep the seeds watered until they come up, and then when they are about one inch tall, it's really important to thin your beets. To thin your crop, simply pull up or cut off with scissors at ground level quite a few of the seedlings. You do this so that there's plenty of growing room around the seedlings you leave in place. Beets are a good candidate for double-cropping if you live in the middle United States or on south, with a long enough growing season for two crops. You can start beet seeds very early in the spring and harvest them just when it's getting unbearably hot in the summertime. Near the end of July, you can plant beet seeds again, and since beets are pretty hardy, you should be able to harvest a second crop right around the first hard frost. Keep weeding your beet crop so that the beets can grow to an even size. To harvest, all you do is pinch the leaves together and gently pull up. That's it! Some people love to eat beet leaves as a salad. But you need to harvest the leaves when they're just a few inches long, or they'll be tough and too chewy. You can save the beets that you are discarding to thin your crop, and eat the little leaves instead of throwing them away. To eat beets plain, simple cut off all but the closest two inches of stems and leaves to the top of the beet, and either leave the root intact or snip it to an inch or so of the bottom. 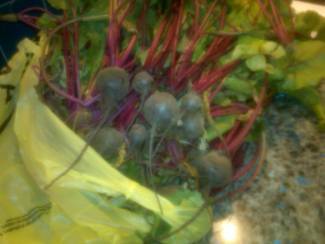 Get a pot of water boiling, and scrub each beet with your hands under running water to get rid of the dirt. Drop into boiling water for 20-30 minutes, and then plunge into ice water. When the beets are cool enough to handle, you should be able to push off the coarse beet skin under running water, and discard or compost. The smooth, shiny beet can be prepared with a recipe such as Pickled Beets in the www.KidsGardenClub.org recipe section. Easy to grow . . . good to eat . . . beets can't be . . . BEAT!